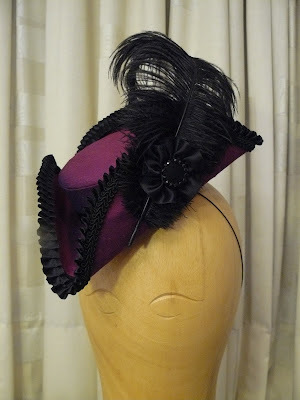 In my continuing experimentations in hat making I have produced this slightly crazy offering! 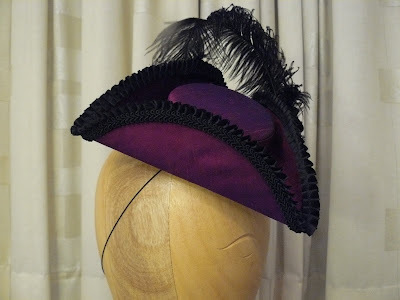 I can't really think why I decided to make a purple silk mini tricorne hat other than it seemed like a good idea at the time.... I can't even claim that its the steroids I'm on (which do make me crazy) as I did practically all of the work on it before I started this course of pills. Despite its lunatic design, I am rather proud of this hat as it is definitely the most complicated shape I have made so far. It has far too many folds and changes of direction in the brim which causes all sorts of problems when making the buckram form in the first place, and with covering it without drenching everything in glue or using visible stiches- which would be bad! The top fabric of this hat is an offcut of shot silk dupion (blue warp and red weft) that I have had for at least five years, so it was about time I made something out of it! In the picture below you can actually see the tricorne mid making. At this stage the crown is separate from the brim which has been mulled; this is when a soft covering of interfacing (in this case vilene interfacing but sometimes flannel or domette is used to cover the buckram form. The brim is about to be mulled with the lover layer not yet glued on. 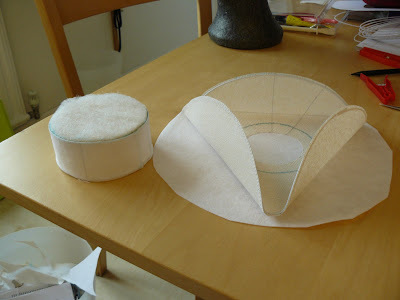 The buckram shape has to be formed into the finished design before it is mulled or when you try and bend and shape the flat buckram into the shape of the tricorne brim the mull layer will stretch or buckle and end up looking dreadfull. Luckily having read the marvellous book From the Neck Up by Denise Dreher I did not make this mistake and waste loads of time! The last picture is a close up of the curled ostrich plume I used to decorate the hat. 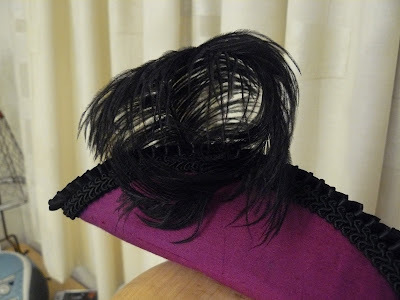 I used a similar method to the one I used on the coque feathers on the black and cream hat, only with ostrich plumes the quill is rather thicker so I had to curl individual small sections by pressing the quill with the clamp of the curling iron rather than wrapping the feather around iron's barrel. I also curled the fluffy barbs with the curling iron so they all turned under rather than flapped about rather messily. So it may be a year or so since it was staged, but I have finally managed to get hold of some of the professional photos taken at the dress rehearsal of Ariodante. I've only got pictures of the first two thirds of the opera, hopefully I'll get the rest very soon. They are a million times better than my little attempts and show how lovely an opera it was; these are a few of my favorites.